1. Go to your windows desktop (or the location where you chose to save the program) and double click on the Delaware Park Poker icon. 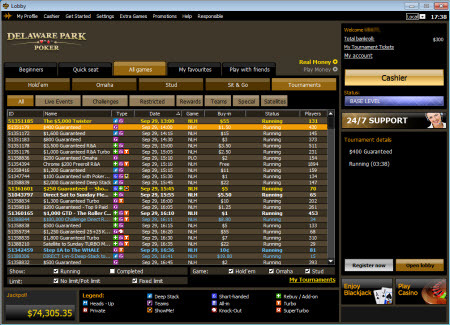 The Delaware Park Poker Download Wizard will open and download some initial setup files. Please wait for this process to complete. a. Press the Start menu, on the bottom left corner of your screen. b. Choose Search and then click Files or Folders. c. Enter "DelawareParkPokerAndCasino" (without the quotation marks) inside the white window labeled "Named". e. Once you have located the file, double click on the Delaware Park Poker icon. 2. 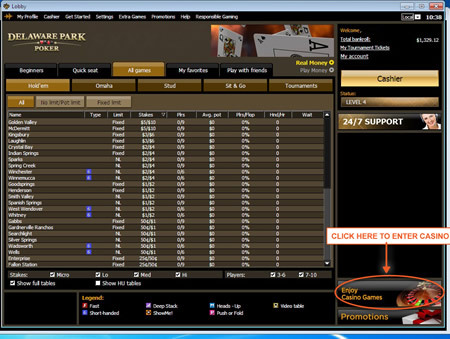 You will be asked to select a folder, on your computer, in which to install the Delaware Park Poker software. We recommend choosing the default destination (your Program Files), as in the example below, by clicking on Next. 3. Upon completion of the installation process, the main poker lobby will open and you will be able to log in or browse all of the poker styles, games and tables.